$4.99/mo or $49.99/year per team. $2.99/mo (switch from competitor). A sports team management tool for coaches, players and parents, helping sports teams save time and communicate better. Pros: TeamTracky clearly has the end-user in mind. I like that the app is simple and very easy to use: you do not have to look for where the information is. You can view and manage each team individually, or get a view across all teams. This is especially convenient when you have more than one child playing in different teams. Cons: Honestly the worst part of Team Tracky is the name. Many parents agree and prefer to use a different name . 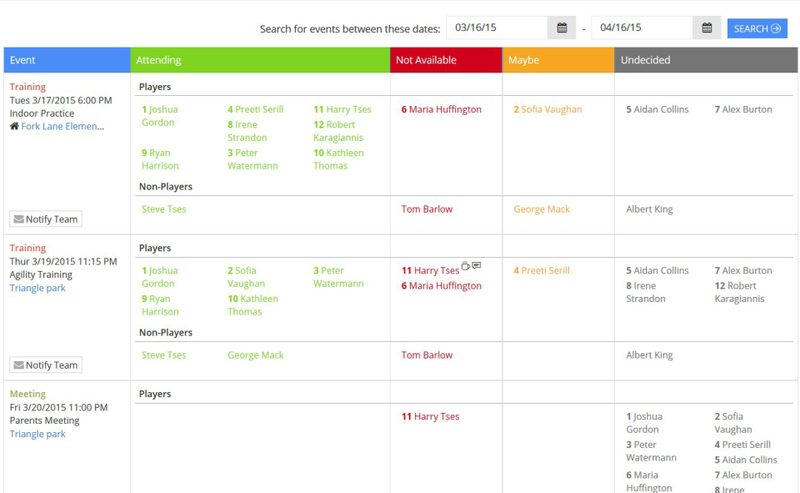 Overall: Can easily track the attendance of your players. Pros: The software is easy to use and with littl knowledge of file manipulation, you can easily setup large numbers of users, games and events. Cons: Adding to the calendar, would like to bring both start and end time, currently just the start time seems t come over for both. Pros: The schedule layout. Is simple and easy to view. I also like the roster format. Everything is simple and viewer friendly. Cons: I have to log on every time. I wish it would stay logged in. I need to enter my email and password each time. Pros: It's very easy to use. Makes communication between coaches and players easy. 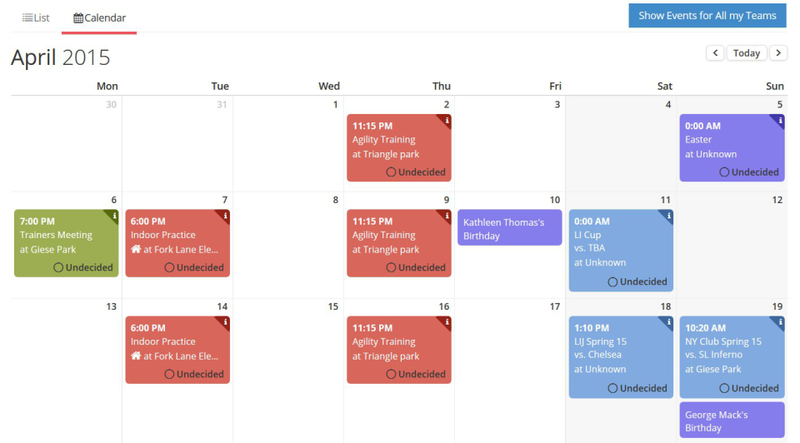 Great feature is the reminders sent out for practices, games and the fact that you can check off your availability without even accessing the website by clicking your availability through the e-mail reminder sent out by Team Tracky. Overall: Easy and quick management, and communication. I couldn't find any faults with the website. I think it was designed to accommodate all features needed to help manage a team sport or any other type of club. Pros: Schedules are on my phone which is always with me! I can easily check schedules, deal with changes and reach out to coaches and teammates while in the go. Cons: I have to re-enter my password from time to time. Also if I am on more than one team ... it sometimes gets confusing. Pros: Love that the schedules can be imported from LIJSL for each team. The billing function is very useful too! Cons: It would be great is roster could be imported so I didn't have to enter players individually. I have enough of that work already. Thanks for the review Bart. Pros: The functionality between multiple teams is a great feature. Switching from one team to another is very easy. Keeping track of fees owed is also simple and easy. Cons: Hard to get the calendar synced with my own calendar. Have tried searching for a while and can't seem to do it. Takes time to load info when going from one team to another. Overall: Makes my life easier. I know where my kids have to be well in advance of their scheduled game or practice. We are adding this functionality in the mobile app soon and you¿ll be able to do that much faster. Please contact our Support Team at support@teamtracky.com for more help. Pros: Easy to use and everyone on our Soccer team was able to understand how to use the software very quicky. Cons: There were a few times when I didn't use the app for a few months that I had to sign in again. Also occassionally it would glitch and not open. Overall: Excellent way for a coach to communicate with his/her team. Much easier than using email for attendance purposes. Pros: Very easy to use. The information showed up on my screen right away. No issues with seeing the information. Overall: I was kept up to date on all events. Pros: I like the email feature that always keeps us on top of any updates/changes to the schedule. Never have to worry about missing any upcoming games or events. Cons: It would be great if there was a way for teammates/parents/coaches to communicate with the app. And maybe some kind of quick acknowledgement feature so you know everyone saw a change to the schedule. Overall: The name is perfect because this software really keeps the team in the know. When there are updates and changes to the schedule, we find out almost instantly. Pros: One subscription covers up to three teams, so we went from paying $$$ [sic] a year for two teams, to $$ [sic] a year with the competitor switch pricing. Team Tracky provides all of the features of the more expensive software, plus a few that they didn't offer. Cons: Can't assign a default home/away uniform color to games, and can't auto assign ALL players to ALL games and events. Overall: Cost savings and comparable functionality. Every time an event or event series is added all players are automatically assigned. In case you've added a player after you've created the event or series, go to his/her profile and click the [Add to roster on all future events] button. Pros: Great for team messages, updates and reminders. It was very easy to select/deselect recipients for messaging. Cons: I wished that I had an option for color, bold and italic text. I also couldn't figure out how to add an image to the messages I was sending. Overall: As a head coach for girl's soccer team I was able to produce a professional looking email for updates on games, practices and registration throughout the season. The scores were updated and game reminders were automatically sent out. It made the job a bit easier. Overall: From my team manager. Team Tracky has been a great way to communicate with my team as Team manager. Pros: I like the ease of use (app, website, setting reminders via email & app), having all team info in one place, Google maps and field addresses, customer service is quick and reliable. Overall: Organization for the season and ease of communication with team. 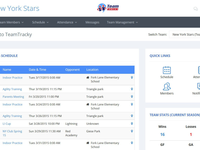 Team Tracky is easy to keep track of both my kids soccer schedules and team updates. Pros: I like that you can communicate with the team directly through TT. Picture sharing is easy and I love that you can add the calendar right from TT to your personal calendar. Pros: Easy to use both mobile and desktop; great for tracking over the course of a season. I like being able to see who is and is not attending. Cons: Sometimes it's hard to make sure your response was saved on the mobile version. In addition, it can be too many clicks to get from schedule to attendance. Overall: It was a great way to keep track of the whole team over the course of the season. It is definitely very easy to use. Pros: When checking in a player for a game, you can write a note right there too as a reason why player is not attending. Pros: how everything is integrated and available within the platform. 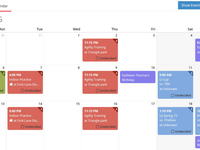 We love the flexibility and dynamics of the calendar. Cons: No spell check feature. It would also be nice to have a price "organizationally," meaning if there is 5 or more teams or whatever the number, it's a set fee. Thanks for the review Andre. We offer pricing for clubs and leagues with great discounts. Pros: The variety of features that I can keep track of games, payments, roster, while group messaging, and upload documents into files. Cons: I would like to be able to text 1:1 with a parent. That's one thing parents have complained about. We were using GroupMe before and they liked it because they were able to communicate with me privately. Overall: I like it because it keeps track of several things as a manager needs to be aware and manage. 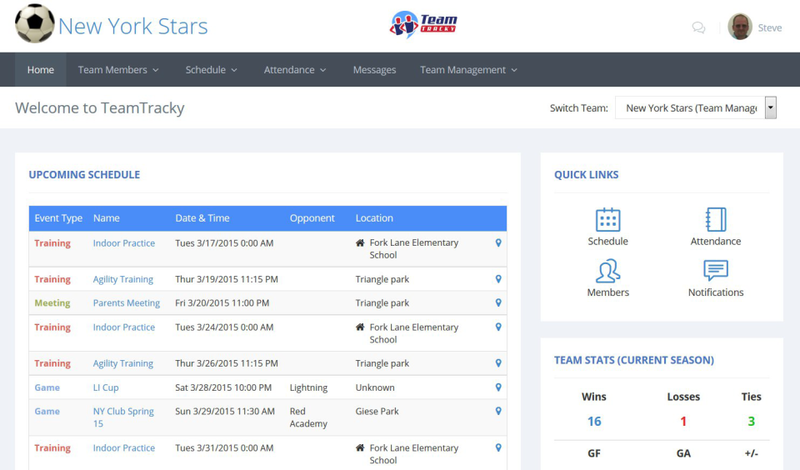 Pros: it tracks all kids sports schedule in one place. This way I don't have to look through the hundreds of emails to find the times of places of all the games. Overall: It helped save me a lot of time and frustration! You can mark all your messages as read either from the web interface or the mobile app. Login and select "Messages" from the menu. Then click the [Mark all Read] button. Login and tap the "Notifications" icon. Then tap the [Mark all Read] button. I never had to deal with customer service so I really don't know. Pros: I like the quick info on games. It was easy to see when and where games were happening including directions. Cons: I did not like having to navigate around within the software for games and practices, and availability. 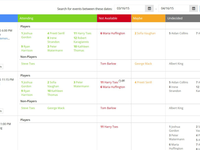 TeamTracky keeps attendance history for all seasons, even for deactivated or deleted members. If you need help on this feature please contact our support at support@teamtracky.com. Thanks for the review Rupal. We are taking privacy and security very seriously. Our website uses SSL (Secure Sockets Layer) encrypted connections to secure data transmission. Users have the option to hide contact info such as email addresses, phone numbers, and postal addresses from other members of the team. No user can see other user's data unless is a team manager. Great experience, easy to use. Pros: Ease of use and functionality. Being able to track team members has been helpful as well as tracking events outside of the team activities. Overall: Better consistency with following schedule. Cons: I have multiple teams and sometimes it's hard to work between teams in the program. Pros: It keeps things organized so I know who is available for what games. It'd be cool if more stats were included. Maybe votes for a team MVP also. Cons: I'd like the emails to be less frequent with more content. An email could say who's in or at least if total number of guys with who is out. Pros: It is nice to have somewhere online that we can go to as a reference to remember the schedule for our team. Cons: It does not always seem to be accessible from the various types of devices we use - desktop PC, phones, ipads, etc. Overall: As a user, it is free for me to use and it offers an online point of reference for scheduling. - Web (desktop, PC or Mac) at go.teamtracky.com. - iPhone, iPad and Android mobile apps. 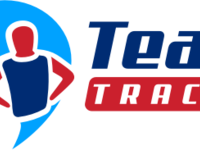 if you have problems accessing your team's info please contact our support at support@teamtracky.com. Pros: I like the fact that you are easily kept up to date on team events and are easily able to update your attendance. Seems to be a pretty solid team management site. Pros: Very convenient app. We havent started the season yet but it seems like it will suffice. Ive used TeamSnap before and really liked that one. Cons: I sometimes have connectivity issues when trying to log on thru my phone app. I cant edit my Son's profile for some reason. The setup was a little confusing between both me and my wife and Son having to setup profiles and not knowing whos is linked to his. Pros: The ability to do as many things as you can without having to pay. The ability to contact all your teammates easily and in one place. The ability to be able to say if you can make it to an event that is scheduled. Cons: The notifications don't always come though. Maybe have the ability to link with calendar on phone for easy reminders. Pros: Great way to keep informed of events that the member is on. And notifications via email are helpful. Cons: Would like to add events to my calendar on the iPhone so I can see all the events and how they work with my schedule. Pros: I love how i can synch my upcoming events directly to my calendar. Thos allows me to never miss a thing. Cons: I dont enjoy how it makes me sign in so often. I think it should stay signed in for a longer peruod of time. Thanks for the review Katharine. The login issue is addressed in our latest release. I find it more difficult to download events to my calendar than another app. I get duplicate emails. Pros: The layout of the app is well organized. It is clear to read. It is easy to understand. I didn't have any trouble setting it up. Pros: The ability to help track team needs and availability. We use it on a weekly basis to set events and meetings. Overall: Ability to see who can attend an event/meeting at certain time periods. It works very well and have had no problems utilizing it. Pros: Can keep track of the schedule. Can view the roster. Can view and track game results. It's a good idea to have all of these items in one place. Great product, saves me time and makes communication to team simple and quick. Pros: Love the schedule portion and the payment tracker. I find that the app is great to ensure everyone gets the info. Cons: Had some minor issues with text and email working on certain providers. Mainly hotmail and att had some issues. Pros: The ease to use it! User friendly for those of us who are not techies I was able to utilize weekly to see my daughters schedule! Cons: App crashed a few times. Too many notifications maybe. There isn't much I don't like about the software. Pros: The app is a practical solution to notify team members of team events and maintain a centralized, shared calendar. 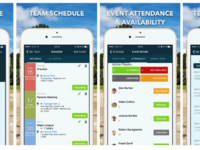 It eliminates a lot of email and allows coaches to confirm event attendance easily and in real time. Cons: An email address should not be required for team members; we are using the app for a team of 8 year old girls and users have found it difficult to properly link their email addresses to their children. Pros: This software is very easy to use and is extremely user friendly. It took about 5 minutes to set up and has been great since.